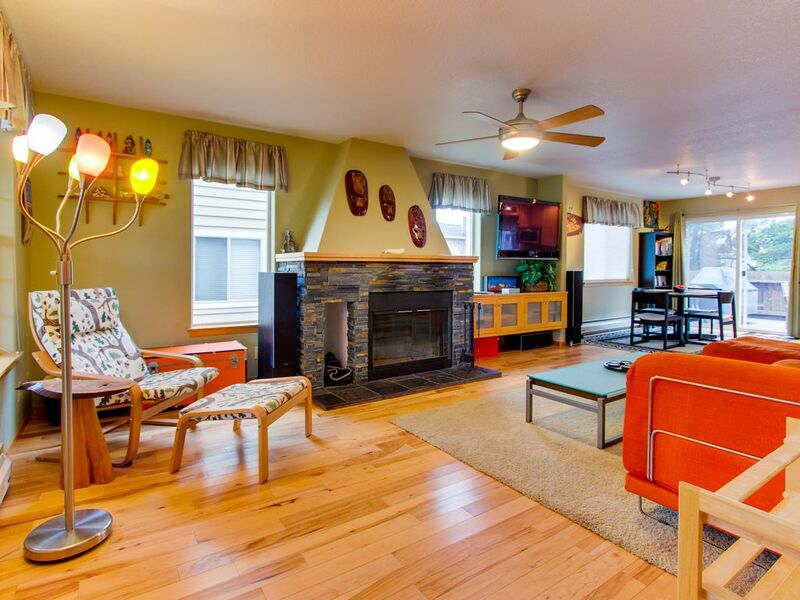 This charming and colorful Pacific City home is perfect for families and groups with its comfortable accommodations, a patio with a custom-built firepit, and easy access to Oregon Coast outdoor attractions, all tucked away in this quaint town's coastal charm. This rental also has cable and a private washer/dryer. The sand and shore are a short walk away for sand dune adventures, beachcombing, and surfing. Also within walking distance is Pacific City's downtown area, which features an array of galleries and shops, as well as award-winning microbrews at Pelican Pub. *Please note: Currently, firewood is not provided at the house. There is a store in town where you can purchase firewood. Parking Notes: Parking is available in the sizable driveway, but the garage is not accessible to guests. Water Access: Walk south to Kiwanda Drive and head west for two blocks to the beach or walk north to Neptune Drive and follow it down to Sea Swallow drive and head north to reach the beach access. My family surfs and came out for the end of spring break to surf Kiwanda for four days. Had no idea what a great place and how fitting a place to stay. We’ll be back! Perfectly situated within short walking distance to the beach and town. (Not so perfectly located on noisy road at night, but nothing a noise maker or fan couldn’t fix.) House has a fun surfing theme, and outdoor shower to wash off sand. Furniture and beds were good not luxury. I would stay here again. The house was clean, comfy, and super cute. Loved the decor! Convenient location. We had a little trouble with the electronics being connected properly, but got a prompt and friendly response from the property manager, which took care of things. The only negative was that there were no coffee filters, which was hard to plan for, not knowing the kind to buy ahead of time. Great, but always room for improvement. House is great. Would have been nice if a few basic kitchen supplies like salt and pepper were available. Had to buy some for $6 at local store. One thing i always want in a vacation rental is hot water with good pressure. This place was perfect!! We didnt use the loft beds, but tried to get up in them. Not easy. I would suggest installing a bar to pull yourself up from the ladder. Especially for young kids. Great place though!! Loved the house, loved the casualness of Pacific City!!! Everything within walking disttance.